experience the free fall thrill with a skydiving adventure! Skydiving is the ultimate thrill. The experience of jumping from a plane can not be matched and this is why skydiving is the number one adventure sport around the world. 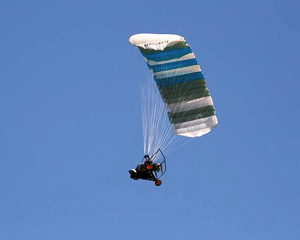 Beginners can learn to skydive with very experienced divers and start with a tandem skydive. Skydiving in Sydney, Cairns, Gold Coast, Hunter Valley, Mission Beach and Coffs Harbour is simply awesome. The more skydiving you do the more you'll love it. So what are you waiting for, take the plunge and start skydiving today. The Coffs Harbour Hinterland provides the exhilarating views for this NSW skydiving experience. Includes free transfers, full training, all equipment, 14,000ft tandem skydive and jump certificate. The spectacular Coral Sea Islands provide the exhilarating views for this North Queensland skydiving experience. Includes free transfers, full training, all equipment, 14,000ft tandem skydive and jump certificate. The Coffs Harbour Hinterland provides the exhilarating views for this NSW skydiving experience. Includes free transfers, full training, all equipment, 9000ft tandem skydive and jump certificate. The spectacular Coral Sea Islands provide the exhilarating views for this North Queensland skydiving experience. Includes free transfers, full training, all equipment, 9000ft tandem skydive and jump certificate. Experience the Ultimate in Beach Tandem Skydiving with amazing coastal views over Fraser Island, Carlo Sandblow, Double Island Point and the Coloured Sands of Rainbow Beach. Freefall at speeds up to 220km/hr from 14,000ft then enjoy the views before landing right on the beach! Nothing conjures up fear and excitement quite like sky diving! Get prepared to jump at 14,000ft over the Fraser Coast, with spectacular views of Fraser Island, the ocean and Rainbow Beach. With up to 65 seconds of freefall, this is one of the most exhilarating experiences on the planet! 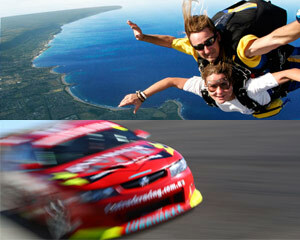 F'Day Special $30 off Skydive to earth at over 200km/h from up to 14,000ft above the beach. Does it get any better than that? Come tandem skydiving over the beautiful coastline of Wollongong and receive an awesome DVD and photo package - to keep the dream and memories alive! Depart Southern Sydney to Wollongong for a Harley Ride, Skydive and fresh seafood: heaven! Feel the wind in your hair being driven in a deluxe 3-seater for 2.5 hours, the rush of skydiving and indulgent seafood lunch afterwards - that's the LIFE! And, a friend can come along for the drive and lunch! Take a Harley Ride from Southern Sydney to Wollongong, add skydiving and a seafood lunch and what have you got? The ultimate day out! Take in everything you love most about Australia - a sweet ride, local seafood, and a view from 14,000ft! NOTE: Unavailable between the dates of 26/12/09 - 08/01/10 This ultimate day experience for two includes: a Harley Davidson return transfer from Sydney for 2 people 14,000ft tandem skydive over Wollongong's Beaches for 2 people lunch for 2 people at Seafood Restaurant after your skydive. Freefall at an amazing 200kph for 40 secs before parachuting gently to the ground while taking in breathtaking views. This is the ultimate in high excitement. If you're only going to skydive once, then why not go all the way at 14000 feet? Have you ever wanted to experience the glory of 'human flight'? Experience freefall and pull the ripcord yourself in this learn sky diving experience. Sky diving is fun and is guaranteed to give you a huge sense of achievement as you learn solo sky diving! If you want to experience the thrill of flying, your time is now. Powered parachuting is best type of flying to take to the sky! The parachute is your wing and is open before you are off the ground! Brave people are wild about skydiving... and it makes the most memorable gift purchase possible! Nobody comes away from a skydive disappointed... to freefall for an enormous 45 seconds and to float back down to earth is one of the greatest things a person can experience! Something truly spectacular! Be a shooting star in the Coast's night sky - the views of the coast lit up in all it's night time glory are unforgettable as they freefall through the night skies before floating slowly down to the sparkling city below! Experience the thrill of Accelerated freefall with our experience skydiving professionals. Over a 2 day course we will introduce you to addictive world of sky diving. We start by teaching you the theory and prepare you for your first solo sky dive, where you get to land the parachute yourself! The ultimate adventure, a solo freefall skydive! Your accelerated freefall (AFF) skydive course includes thorough ground training followed by the most awesome experience - your first solo skydive, where you will be accompanied by two of our expert instructors. What a rush! Are you ready for the ultimate shot of adrenalin? Want to connect with new friends? Or maybe you are just a little bit crazy? Then go solo! Stage 1 AFF (Accelerated Free Fall) involves 1 full days ground training followed by a solo sky dive wearing your own parachute. The Accelerated Freefall from 14,000ft is your first sky diving experience. With 8 hours of training you are instructed how to exit the aeroplane, your body position in free fall, height awareness, emergency procedures, pulling your own ripcord and how to fly your parachute!